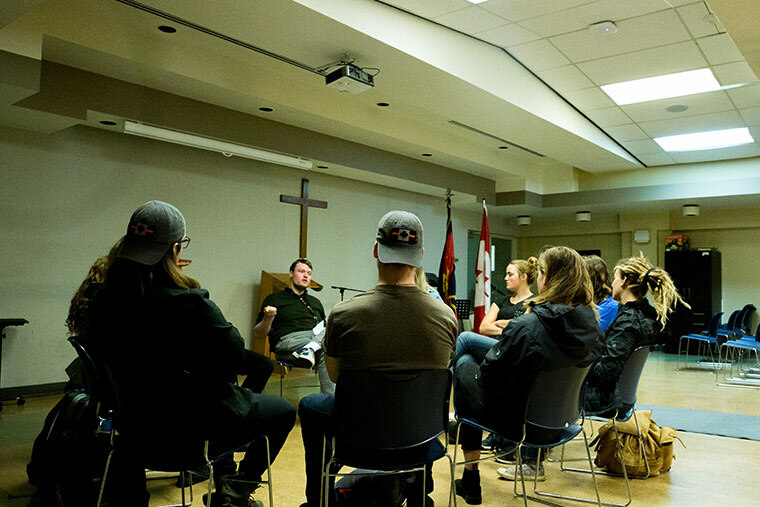 I’m a chaplain for The Salvation Army Harbour Light Addictions and Recovery Centre in Vancouver’s Downtown East Side. I also preach occasionally with the Salvation Army 614 Corps, and teach with The Salvation Army War College. Did you pursue any additional education or training after Columbia? I’ve done a little here and there. One year towards Master’s in Theological Studies at Regent College, and some counselling classes. How many years have you been a chaplain? I just completed my first year at Harbour Light, but worked with The Salvation Army for almost three years previously as a case worker. How do you find your way into your current role? During my time at Columbia Bible College, I became the first ICS student to perform my internship on North American soil when I came to work for a low-barrier housing organization in the downtown east side. That year had a profound impact on me. I found God working in unexpected places, and really wanted to learn more. After graduating from Columbia, I had the option to go to either Conrad Grendel University College in Ontario, or to Regent College here in Vancouver. After prayerfully considering our options, we decided to move back into the downtown east side full time. Once we were back in the city, I was blessed with full time work at the Salvation Army Grace Mansion, working with people who were attempting to get back on their feet after going through an addictions recovery program. After three years (including a year and a half of midnight-8AM shifts!) I was offered the opportunity to combine my love of people and my desire to share the Good news of Jesus as a chaplain at Harbour Light. What are some ways your time at Columbia equipped you for what you’re doing now? CBC taught me that true faith has legs. It’s not enough to intellectually know God – we must work out our faith practically. If what I am learning in the classroom is not applicable to the hurting people I interact with, it is as good as useless. Columbia led me towards a faith radically centred on Jesus, and gave me room to ask hard questions – What does it mean to be saved? What does salvation look like for a life-long drug user, for a prostitute, for a severely mentally ill man? What really is the good news? But rather than leaving me in a place of questions, CBC gave me hope and led me towards good and healthy answers. I would not be able to do the job I’m doing now, where I am talking to hurting people on a daily basis, if it were not for the radically incarnational Jesus I met while at CBC. How does your job connect with your sense of calling? I believe I am called to introduce Jesus to people. I am called to walk alongside those who are hurting, and to reveal to them a God who grieves with them, and who loves them. I am incredibly blessed to be able to live my calling as a Chaplain. What do you do in a typical work week/work day? Every day is different. As a chaplain, I am part of a small team responsible for the spiritual care and support of close to 150 staff and well over 500 clients of Harbour Light. Some days I may be grieving with a co-worker who is having a hard time with the people he works with; another day I might be talking to someone who has relapsed for the fifth time and is about to give up hope; another day I might be celebrating with someone as they make it to one year clean and sober, and move on to bigger and better things; another day I might be working through the book of Mark with a new Christian, helping him see Jesus with new eyes. There really is no ‘normal’ for me! Introducing people to Jesus. Many people know about Jesus, but few people actually know him. Getting to know him can change lives, and it is an incredible privilege to be a part of that process. I love just sitting with people and talking with them, guiding them towards the good news of Jesus. I work with people who are dealing with life-long addiction and mental health issues. Some days are very hard. I have attended several memorial services over the past couple of years. I’ve watched people relapse and not return. But I trust, even in those deeply challenging times, that Jesus is using me in this position to shed some light even in people’s darkest moments. I have been working with one fellow for almost a year now. During that time he has gone from mentally ill and addicted to Crystal meth to being radically transformed by Jesus. Last week he reconnected with an estranged family member, and it was evident that God was present. How can someone tell if Chaplaincy is the right kind of role for them? You have to really, really, really love people. 2. You have to have a tremendous amount of patience, and a deep sense of the peace of Christ in the face of deeply troubling situations. 3. You must be able to establish strong boundaries, and keep to them. If I carried home the pains that I face, it wouldn’t be fair to my family, and I wouldn’t be able to cope for long. I need to be able to focus intensely on the person in front of me, pray for them as they leave, and then trust that God is doing the rest. What advice do you have for someone seeking this kind of role? 1.Make sure you know yourself and your limits very well. The burnout rate for working in this environment is very high. Get into the habit of healthy self-care, and make sure that you are rooted in a community that can love and support you. We can’t do this on our own. 2. Do not go into this field thinking you are going to save people or fix people. All we can do is share the love of Jesus with them. If you think you’re going to fix people, you will be sorely disappointed.